From the front office to Dr.Bicaki this was a seemless process and I have no complaints . They did did dosome teaching for the new employee but I did not mind . Over all as expected and the follow up with future procedures was thorough and fine with me . From the front office to Dr.Bicaki this was a seemless process and I have no complaints . They did did do some teaching for the new employee but I did notmind . Over all as expected and the follow up with future procedures was thorough and fine with me . GREAT DOCTOR! Doctor Nihal was very pleasant, extremely professional and genuinely caring. Excellent staff ! Waitingtime less than a minute. 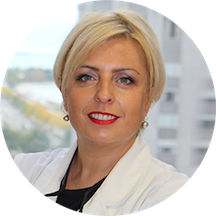 Dr. Nihal Bicakci is a graduate of University of Illinois at Chicago, College of Dentistry and has taught as a clinical instructor at the Restorative Department. Dr. Bicakci has been practicing dentistry for 18 years. A strong believer in continuing education as a means to ensure that her patients receive the highest quality dental care, Dr. Bicakci has completed post graduate dental program, a three year specialty program in Advanced Prosthodontics and Implantology “Surgical and Prosthetic Treatment” at UIC College of Dentistry. She has presented at the American Academy of Fixed Prosthodontic Meeting and has been an active member of American College of Prosthodontics and American Prosthodontic Society. She has also participated in many other continuing education courses. She is committed to providing her patients with personalized care and state-of-the-art dentistry. Our office has a cancellation policy, please give us at least 48 hours notice if you are not going to be able to make it to your appointment. Literature Review Presentation at the American Academy of Fixed Prosthodontics annual meeting. Great doctor! Very personable and sweet. Did a great job on my teeth! The X-ray machine was having issues and the appt. Took much longer than it should have. Have been attended by 2 different dentists at this surgery, both were excellent, gentle and professional. I fear dentists but would readily attend either again. Would never come here again and am waiting for a refund. Scam artists. I had a great visit at doctors Bicakci office. She was very friendly and patiently explained me my treatment options. She also walked me through different payment options and helped me to choose what's best for me. I was pleasantly greetedby her staff. And they were very helpful throughout the whole visit. I am really glad that I found such great doctor. Great dentist. Very kind. Very professional. Nihal took a long time for a straightforward appointment. Her assistant did not seem very experienced or gentle. I will not be returning. Always super nice ladies, in and out very efficiently! Particularly with all the work that I needed done, I must say I had an overall excellent experience with Dr. Bicakci. She is very personable, and took the time to explain everything, incorporating images that she had taken. I felt verycared for, and the pain control was excellent (there was none). The team in her office does an excellent job. I am happy to say, I have found my dentist. Very friendly, with excellent communication skills. Highly trustworthy! I particularly appreciate how she includes her process of decision-making in formulating recommendations in our discussion, and methodically reviewed the xrays. Had my teeth cleaned a month ago by Dr. Nihal Backci. It was very well done and professional. Suggested I get my wisdom teeth taken out for better overall dental health. They worked with me on getting a time where Iwouldn't miss work. They are great for people who work 9-5 like me, because they have later hours. Dr. Ozdemir Bicakci did the extraction on my wisdom teeth. He was very professional and did a great job on making me feel comfortable during a very stressful surgery. They even called me Monday morning to see how I was feeling. I would highly recommend them for your dental needs. Dr Nihal is the real deal. I was so scared to have a rear tooth extracted, she was so patient and had it out in no time. The staff are really friendly, wouldn't trust my smile to anyone else. Dr. Nihal is fantastic! For the past 9 years I have been traveling back to St. Louis to see my dentist. I'm super picky! I've tried 6 in Chicago to no avail. The other day I tried this practice. So elated!Dr. Nihal and her staff are wonderful! I finally found a dentist I trust. She was professional, explained everything, and was great with a nervous Nellie like me. I've not found anyone that can get a full set of X-rays and her team accomplished it! (I'm a terrible patient). The whole staff is wonderful and I highly recommend. I had a cleaning and then three cavities filled. She also found a fractured tooth and was able to save my healthy tooth without costly procedures. She really thought about the best way to protect the tooth. I'm happy! And trust me...that rarely happens. quite a pleasant experience, for a dds office. Dr Nihal and her staff are amazing. Professional, yet calming. Highly recommend! After we refused to do the full set X-ray as we already did it in Feb 2014. The doctor showed up and only examined me by looking into my mouth in seconds. She did not look into my husband mouth even.Then she said if you wanna be my patient we need to have an x-ray done . We asked about cleaning and she said no cleaning and that is it for consult visit you can come back for cleaning seriously ?? I felt we were treated as source of money not a patient at all. Thanks god we knew this before we go for anything in this service. Btw we came in 10 min earlier than our appointment and we also filled all the papers online before we come. With all this we waited about 1 hour before someone came to us for the full X-ray . Dr. Bicakci and her staff were courteous, kind, and professional. Dr. Bicakci explained each step of the exam and subsequent treatment and answered my questions clearly and thoroughly. Dr. Bicakci. and her staff even stayed late to accommodate my schedule. I highly recommend Dr. Bicacki. Thorough, professional, efficient, pleasant, responsive. Unsure yet. I had the original work done in San Antonio, TX and it was quoted to be a third of the price. I still need to figure out of this place is trying to fleece me or are more comprehensive. It was wonderful :) Her staff is super nice, and she was amazing! She made me feel so comfortable and relaxed, very fun lady actually! But she gets straight to the point with your teeth, which i loved. I felt reallyinformed. I was actually very nervous at first, because you never know what to expect when you move and have to get a new dentist, but i am so glad I found Dr. Bicakci. The environment was wonderful. The most comfortable i have ever felt at a doctors office for sure. I'm sticking with her for sure! New dentist for me. She was professional and carefully outlined how further work can be completed with an insurance breakdown giving me a good idea of out of pocket costs before things begin. I think it was smooth sailing. When I left, I was satisfied with my ending results. I will really like to make them my primary dentist office if possible. It was great! I was seen right away, and they explained everything that was going on while it was happening. They told me all the work i need done and why. The overall experience felt personal and comfortable...definitely my new primary dentist.